Rocky IV | WHAT A FEELING! It’s a bit difficult to remember that the first Rocky was just a movie—and an enjoyable, funny, and sweet movie at that. The subsequent entries have gotten exponentially bloated, so there’s no longer any sense of these things as merely films. They’re cultural phenomena, big and tacky and seemingly bearing no relation to other films. All the sequels have been written and directed by mega-star Sylvester Stallone; and Stallone may be many things, but he’s not stupid (despite some of the airhead statements he’s made in interviews). He’s got a gut-level instinct for what works on an audience’s emotions. But he blows up his narratives (like his bulging muscles) to such huge proportions, you wonder how he’s going to top his awesome 1985 one-two punch of Rambo and Rocky IV. Rocky IV finds the Italian stallion happy in his home life (Talia Shire still suffers as his wife, Burt Young still slobbers as Paulie) but wondering about a new challenger form the Soviet Union, Ivan Drago (Dolph Lundgren), also known as the Siberian Express. This Drago, who is roughly the size of Vladivostok, is apparently trained by computer and pumped with steroids. Stallone shrewdly sets him up as the exact opposite of Rocky: Drago is bigger, blonder, colder, and run by committee. Not like our boy. When Drago demolishes Rocky’s pal Apollo Creed (Carl Weathers) in a gaudy Las Vegas exhibition (James Brown and some showgirls do a pre-fight routine), Rocky vows to pulverize this Russian—and do it in Moscow. This sets up the obligatory scene in which Talia Shire tells Rocky, “You can’t win,” to which the big guy mumbles something about doing what he’s gotta do. Rocky retreats to a woodshed somewhere in the Soviet wasteland (really filmed in British Columbia), where he trains in the snow by carrying logs across his shoulders—the most embarrassing of Stallone’s many Rocky-as-Christ images. This all leads up to the big fight in Moscow, and of course I can’t give away the ending—that would ruin it for those half-dozen or so people who actually wonder whether Rocky might lose. But Stallone has put together another audience-pleaser, and one that is (in my estimation) a lot more fun than Rocky II or III. Having set his film in Russia, Stallone seems to have been inspired by the great Russian montage filmmaker, Sergei Eisenstein: Stallone has gone montage-mad. Every 15 minutes or so, the soundtrack erupts with a song that cues a montage of Rocky training, or flashing back through the last three movies, or running up a mountain, where he stands at the summit with his arms outstretched like the Christ overlooking Rio de Janeiro. And speaking of summit, of course, this film has its own view of American-Soviet relations. Surprisingly enough, after 90 minutes of jingoistic hooey (you’ll be booing those Commies with the rest of the audience), Stallone turns around at the end and opines that hey, we’re all just people after all, regardless of our nationality. Even Drago exhibits a tremor of capitalistic independence. 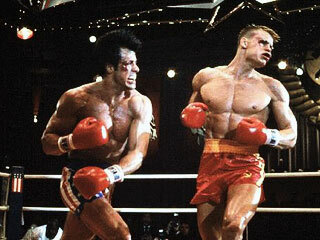 In its own inarticulate way, Rocky IV gets sweet on us again, right at the end. Stallone never topped ’85, the year of Rambo and Rocky IV, but who has? That duo so perfectly captured the inflated moment of the USA post-Reagan reelection, post-Grenada, post-L.A. Olympics, and pre-Iran scandal/market crash. The fight in Rocky IV is ludicrously stage-managed for maximum manipulation, and it turns out that’s exactly what everybody wanted. This entry was posted on Monday, May 30th, 2011 at 3:00 am and is filed under 1985, Action, Rocky-Rambo, Stallone. You can follow any responses to this entry through the RSS 2.0 feed. You can leave a response, or trackback from your own site. Just came across your site. All really cool reviews. Thanks alot for making these vintage reviews available. Gives a different and more timely perspective on these films.